Following the Second World War, the Australian Government embarked on a programme to develop a local manufacturing base. Hefty import duties were placed on imported manufactured goods., often of the order of 80%. In the case of motor vehicles, considerable tariff reductions were applied where a specified and significant local content was achieved. For this reason, many large international motor vehicle manufacturers established local Australian manufacturing facilities. Over the years, local outposts were established by BMC, General Motors, Ford, Chrysler, Toyota, Nissan and Mitsubishi and others. A large component supply industry grew up to support these local manufacturers. 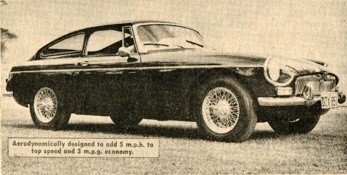 In the case of MG, it proved cost-effective for BMC to locally assemble the MGA and thereafter the MGB, as, by achieving a 45% local content a considerably lower tariff was applicable. This was achieved by using local tyre, trim, electrical component and paint suppliers, in addition to the labour cost component afforded by local assembly. CKD ("completely knocked down") kits were dispatched from the UK for local assembly. 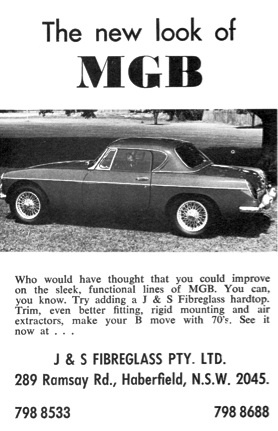 This "Australian MGB" actually had no connection with the Abingdon MG factory itself, with components being supplied by "Pressed Steel", BMC "Tractors and Transmissions Branch" etc. etc. 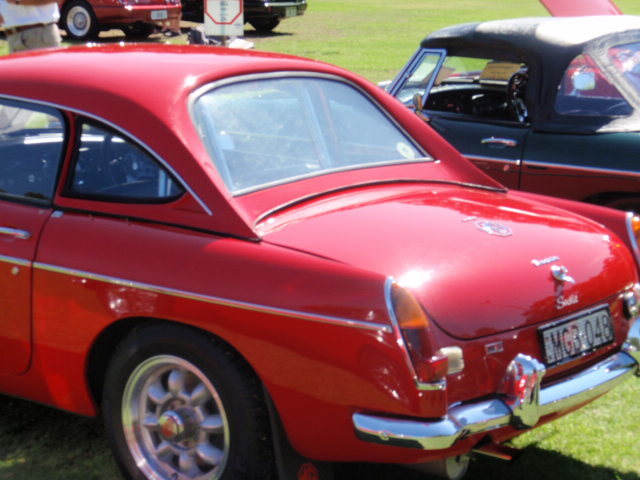 Ultimately approximately 10,000 MGB's were built in Australia between 1963 and 1972. A pallet at Abingdon, loaded with four MGA chassis and ancillary components, ready for export to Australia. 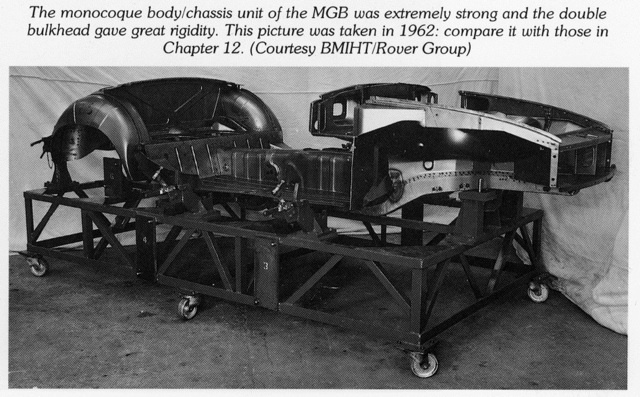 The MGB "platform" as it emerged from Pressed Steel. 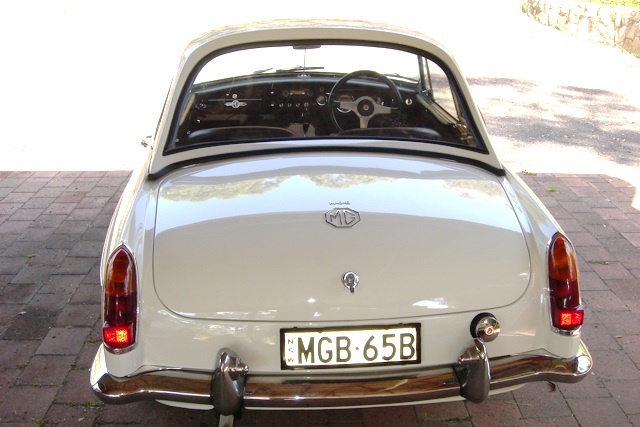 It was in this form that the MGB was exported to Australia, with the outer panels fitted in Australia. 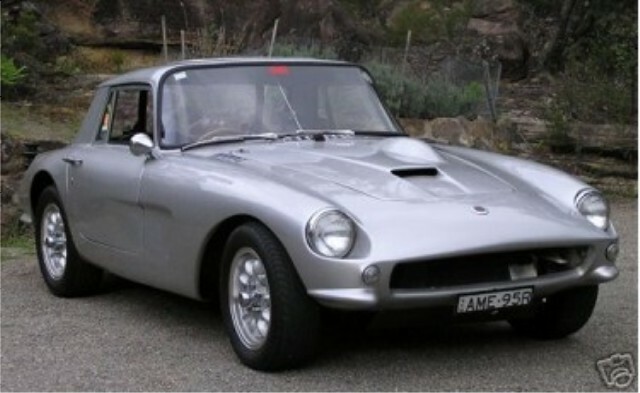 Despite Australia's relatively benign climate, with local assembly of MG's (A, B, Midget), Triumph TR4's and Spitfires, in addition to fully imported Datsun Fairlady's and Honda S600/S800's, the local sportscar market was large enough to support its own aftermarket hardtop supply businesses. These included "International Body Styling" and "Peter Manton Motors" in Melbourne. The most prolific by far of these however was "J&S" based in the western Sydney suburb of Ashfield. 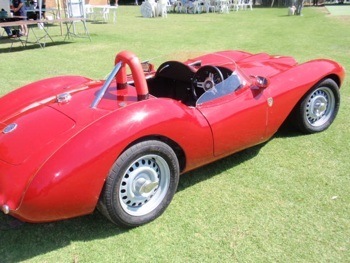 Thereafter followed another complete car, again available in kit-form, the "Hunter" sports car, designed by Len Moya, who had meanwhile joined the J&S concern. The Hunter however was not a great success with only 14 completed before the project ended by 1961. 1961 also brought with it a severe "credit squeeze" (these days termed a "recession") which nearly drove J&S to the wall. The manufacture of fibreglass industrial tanks kept things ticking over however till the national financial situation began to ease, and J&S looked for new automobile ventures to explore. 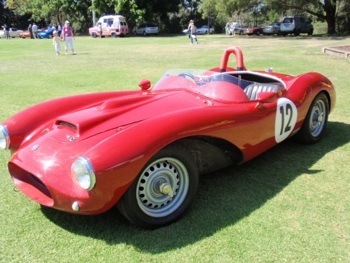 They acquired the body moulds for the Buchanan Cobra sports car from "Pressed Metal" (who coincidentally assembled the MGA and thereafter the Mk1 MGB's in the Sydney suburb of Enfield). It became clear however that the manufacture of complete motor cars and related kits was not the solution to J&S's survival. 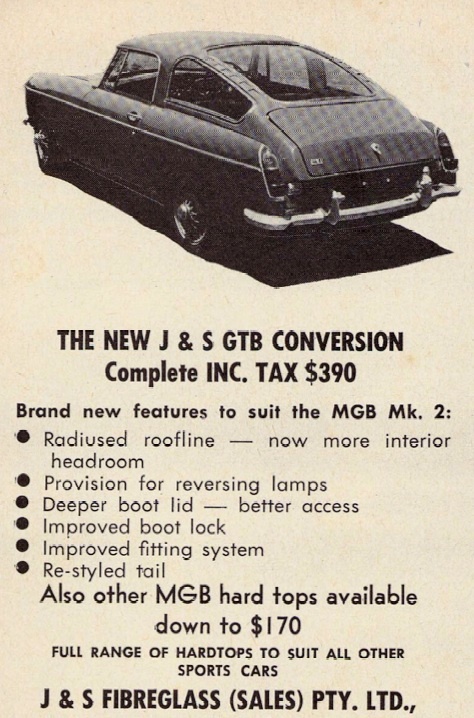 The introduction of the locally assembled MGB in 1963 however brought with it the realisation of the potential for after-market sports car hard tops, and J&S set out to fill this niche with great success. 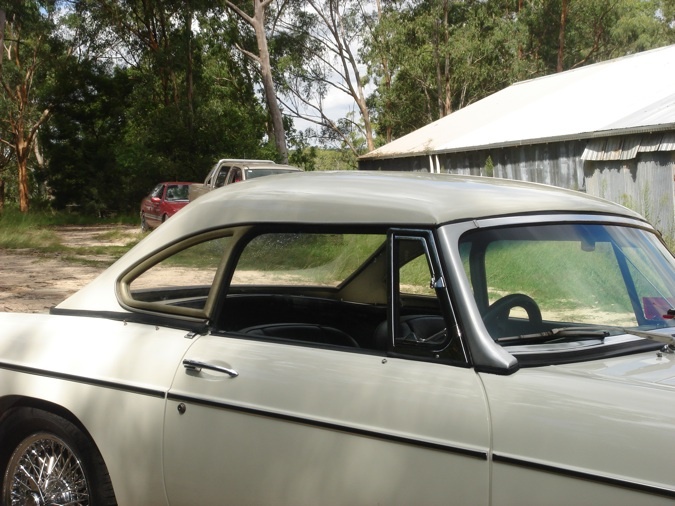 With the MGB GT never locally assembled, there was a marketing opportunity for after-market fixed hardtops in Australia. A gifted stylist from Melbourne, Anthony Pusteria had already had two of his designs produced. 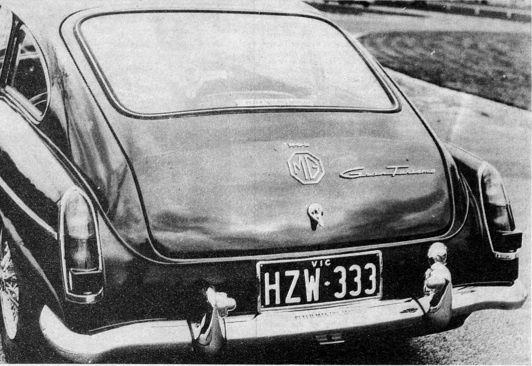 The first was sold by Peter Manton Motors in Melbourne. 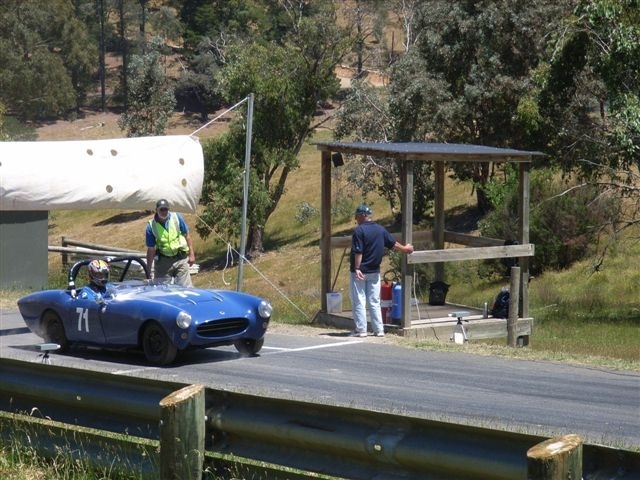 as the "MGB Gran Turismo." 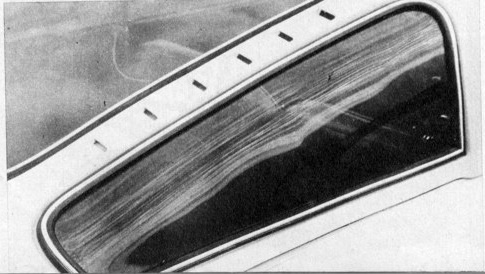 Tony Pusteria, having accepted a position with Chrysler in Detroit in "Styling", sold his business, "International Styling" and under the new owners, the hardtop was remodeled with a Kamm tail and the opening rear hatch was eliminated, necessitating luggage access through the cabin. 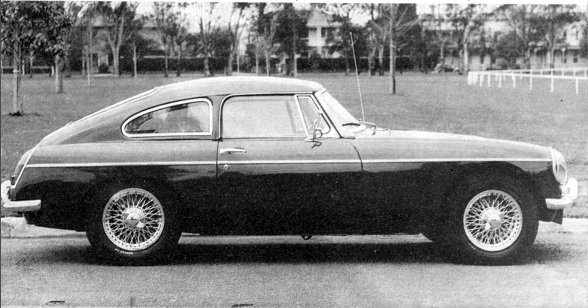 This revised design was marketed across Australia as the "MGB Fastback" by International Body Styling. Tony Pusteria sketch of the 1964 "MGB Gran Turimo" and the 1965 "MGB Fastback"
En route to Chrysler in Detroit, Tony Pusteria made contact with J&S in Sydney, ultimately contributing at least one design to J&S, which was subsequently marketed as the "MGB GTB" fixed hardtop. 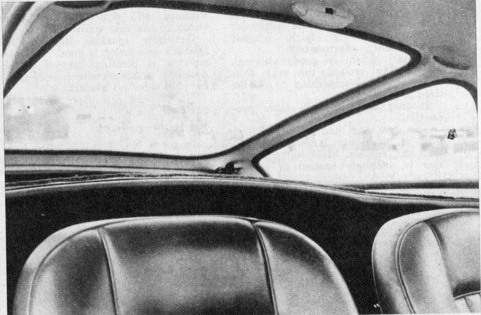 Tony Pusteria's initial sketch for the J&S "GTB Hardtop"
The GTB was remodeled in 1970 with a more curved roof profile and a larger boot-lid which afforded better headroom and greater convenience, possibly at the cost of a less dramatic appearance. 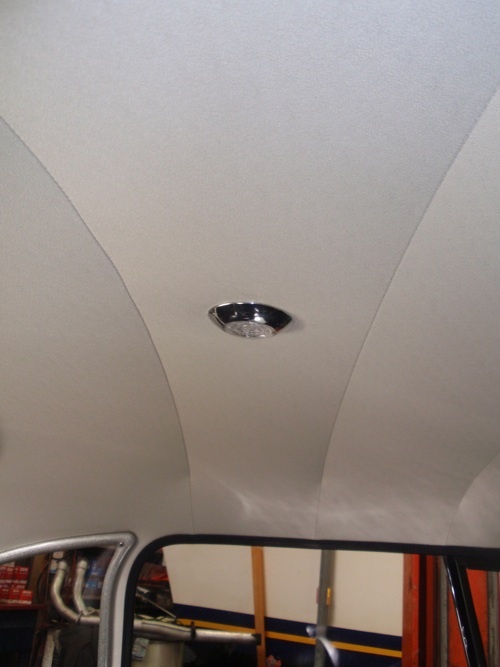 The finish on J&S hardtops was always far more elaborate than that offered on most alternative hardtop producers' products, with a car-style interior lining suspended on metal bows as was normal practice in large volume production sedans. 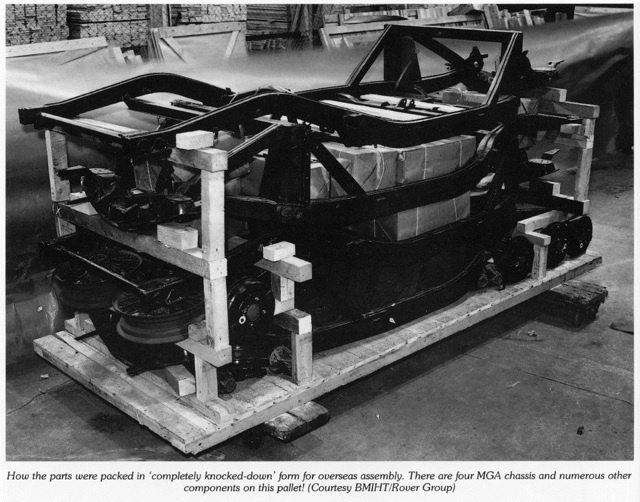 In the case of the GTB, proper "flow-through" arrangements were also included. 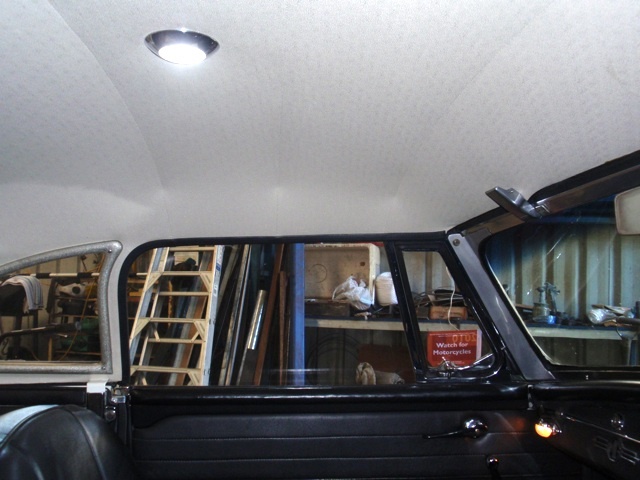 While this J&S hardtop has been fitted with a non-original interior light, the quality of the interior fit-out in a J&S product is obvious. 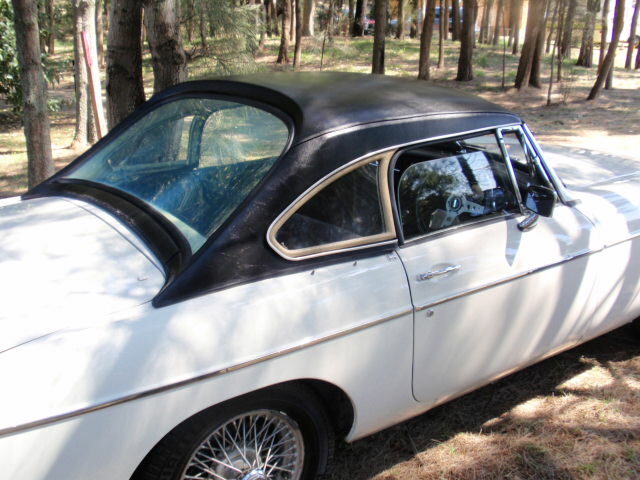 The majority of J&S production and sales however always remained the detachable style of hardtop, in particular for the MGB, which was by far the commonest sports car on Australian roads. Despite Australia's mild climate, the fitting of such a top became very popular, probably due to the stylish lines of the J&S products; in today's terminology, they were simply "cool". 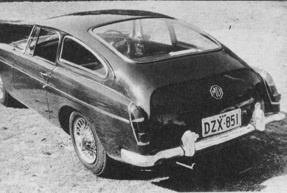 A number of different styles of detachable hardtops for the MGB were produced, with at times, up to three different styles of detachable styles available at any one time. As a result, with dwindling sales of MG's, altering import duty concessions and the need to free up production space for the imminent Leyland P76 (Ultimately a sales disaster). 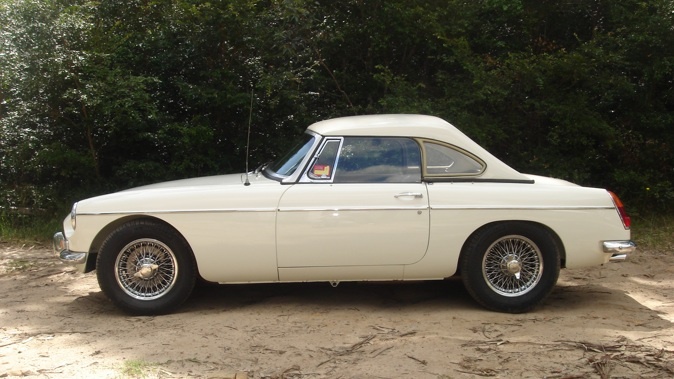 the decision was taken by Leyland Australia to cease local MG production and to not bother with importation of sports car. Consequently, J&S's market progressively disappeared. The company tried to produce alternative products, including a quite successful "dune buggy", but the end finally came when J&S went into voluntary liquidation in 1980. 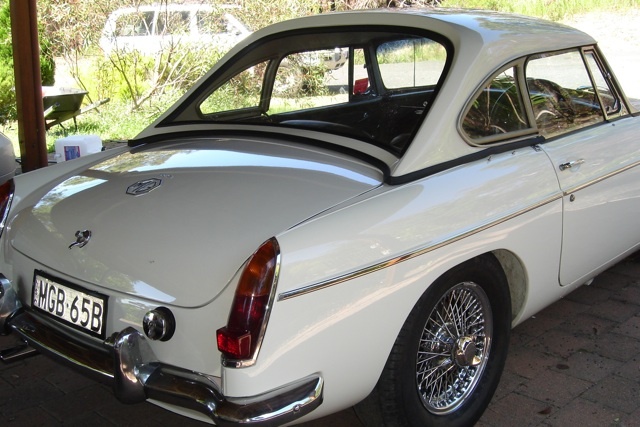 Comments on "Australian Hardtops for MG and Healey"
Good article, Thomas. Did you research it yourself? S Hunter) had in turn lost contact with Jennens. their designs are now internationally recognized and admired. shame to let all my work go to waste, so I decided to post it here. 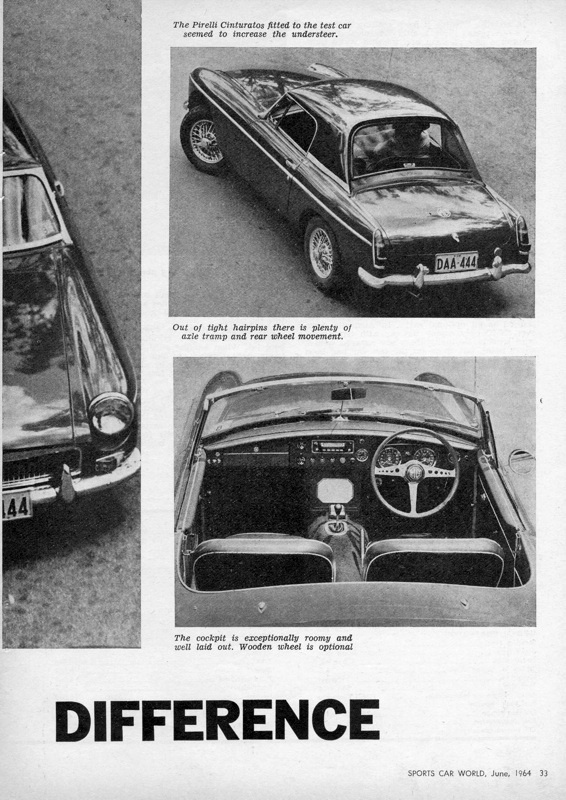 Wow, love the very last photo - with the extra piece of window glass, gives the car a Volvo 1800 feel. Great article! Very nice piece Thomas. Thank You. I wonder if any of the GTBs made it over here. Great Read! Have you sent this to the MG Experiece? This would be so great for their library!!! First rate all the way around. Thank You! just came accross this site- excellent article- I have a J&s Hunter(since 81) and a J&S buchanan(since 93).I knew Jeff Simmons as he worked on my car around 1982 as he was also on the last of his buggies.There where 18 hunters built and the last 66. mine was a 64. the first car he biult was a renault moir special. 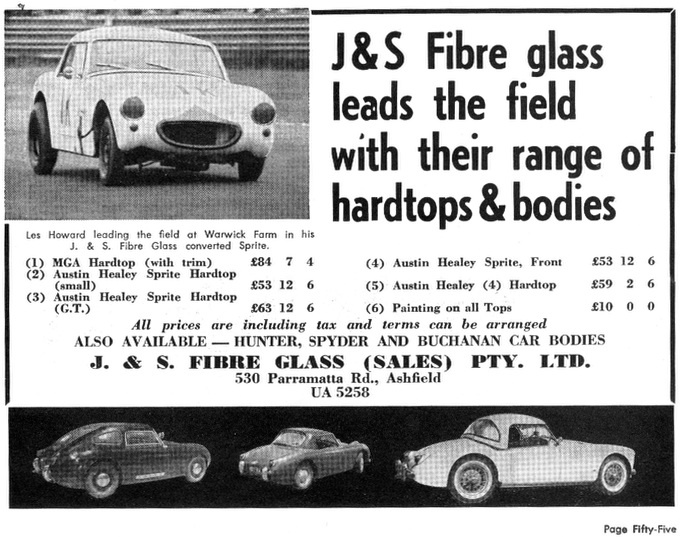 if you can find the Australian sports cars and specials magazine by mike mccarthy there is 2 great articles on J&S in there(comes up on ebay occassionally). I think you will find it was Jeff Simmons that is in Qld and last I heard he was quite ill. Jennins left the company in the 60's from memory.Len Moir was originally a shoe salesman and designed nearly all of J&S cars/hardtops. ps = also still have a letter from Jeff re my car on J&S letter head. hunting info about them, you have answered a lot of my questions. Next to find out the numbers made of each ? Thank you !! Fantastic work on a great product!!! should look at splitting the article into Parts 1 and 2, making it more readily transmissible. Nigel, at least one of the moulds for one of the MGB hard top styles has survived, possibly more. I'm currently waiting to hear back from the owner of the red Buchanan car shown in the article, who has the moulds for the Buchanan body. He informed me just recently that he also has the moulds for one of the MGB J & S hard tops. This was a fantastic find for me. I am in the process of documenting full histories on australian fibre glass beach buggies. The J&s range is one of my next stories. Your research provides an excellent insight into a background story. Thank you for your contribution to our lost motoring history. I was watching an episode of "Homicide" last night, and an MGB with one of the International Body Styling tops features pretty heavily - some great close-ups.Let me know if you'd like screen-caps! Hi ChrisHow interesting. I just looked up "Homicide" and it was current from 1964 to 1977, right in the period of the MGB, though I'm surprised the show (and the MGB for that matter) ran for so long! By all means please either post screen caps here for the interest of others if that is possible, or email me, aczfam@tpg.com.auThanks for taking the trouble to comment.